Death they say is inevitable, but one thing which is important is for one to have lived a fruitful and fulfilled life, before death eventually strikes. One week past (Oct 15) an ace radio presenter and Head of News, Radio Continental (Lagos), Momoh Kubanji, passed on at the Military Hospital, Yaba, Lagos. He died of a protracted illness; he has been in and out of hospital in the last few months. He was to go for a second test when the ailment relapsed and terminate his precious life. He was aged 46, the popular presenter was married and had kids. He worked with Raypower, Radio Nigeria and Rhythm FM before moving to Radio Continental. Since he started out as a reporter with Federal Radio Corporation (FRCN) two decades ago, Momoh Kubanje's voice has ruled the air waves even though he has changed stations on a number of times. It is always a thing of sorrow to lose someone as enterprising as Kubanje who has recorded landmark achievements in the media world as a presenter par excellence having started his career over two decade ago at the Federal Radio Corporation in a reporting capacity. His exit without doubt, created a vacuum in the nation's media, especially the broadcast media where his voice ruled the waves for more than two decades even as he plied his trade most professionally at different organizations where he worked and especially at Radio Continental. Many prominent and highly placed individuals have paid visits to the family he left behind dropping some touching comments inside the condolence register etc. This last respect is indeed good but what I can consider to be more helpful is looking at the family he left behind and proffering good provisions to cater for his wife and children and other dependants. Over the years one can simply understand that the welfare plans of an average media house for its workers in most media houses is nothing to write home about in terms of pensions, insurance etc. As a matter of urgency there should be a paradigm shift which would be targeted at addressing these salient issues; human life is sacred and should not be treated with levity. Infact journalists are often faced with tragedy in double portion, their employer underpay them and treat them with lack of respect, while the public look at them with disdain, with the view that they are only there to receive brown envelop and other form of gratifications to meet ends meet with no modicum of dignity. Apart from these, assassination and other hazards in the field are the inevitable vices faced by the members of the fourth estate, or the watch dog.Journalism is a noble profession anywhere in the world Nigeria sshould not be and exemption, stakeholders in the industry should act proactively in the interest of the affected practioners. 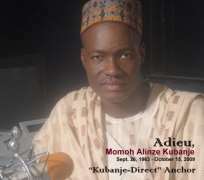 The good deeds of Momoh should not go down the drain, even in death, he should be celebrated, and indeed he would be missed in the broadcast business, Momoh Alinze Kubanje rest in the blissful side of the Lord…Adieu.